Waredaca offers a comprehensive array of boarding facilities, programs and services for your horse. The farm is a 220-acre recreational and horseback riding facility. Included on our property are five cross-country jumping courses, one 80 x 200 indoor arena, two all weather outdoor-enclosed riding arenas, schooling fences and many other amenities. Adjacent to us is the Patuxent State Park land, maintained in its natural ecological condition. Easy access to thousands of acres exists for hours of pleasure riding directly from the farm. While primarily an ‘eventing’ barn, we are not an exclusive eventing stable by choice, and welcome the diversity of students and boarders who make up our Waredaca community. All of the horses are cared for by a qualified and conscientious staff with many years of involvement in the horse industry. Our current boarding rates for field and stall board are listed below. If you are seriously considering boarding here, call to schedule a visit. If you are looking for a friendly yet professional atmosphere offering expert, attentive care for you and your horse, you will find it here! Approximately 80 horses live at Waredaca. Mares and geldings live in separate fields. Robert and Gretchen live at Waredaca, as do other family members; this allows for careful supervision of all our animals and activities. Your dogs are welcome at Waredaca if they are well behaved and supervised according to our Dog Policy. Adjacent to the farm are thousands of acres of Patuxent State Park land, which is maintained in its natural ecologic condition. Our own farm brewery, the Waredaca Brewing Company, features excellent beers, non alcoholic and snack options plus much more! We have two major barns where boarders are stabled. In our Red Barn, located off our main entrance drive, we have twenty permanent stalls for boarders. Stall lockers, grooming and medicating areas and a wash stall are here as well. 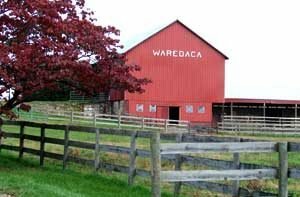 Our White Barn, located at our East Entrance off of Howard Chapel Road, has additional permanent stalls and 26 permanent “temporary” stalls for our guests attending special events hosted at Waredaca. Horses at Waredaca for Training Board with Steph Kohr are generally stabled here. A Field Boarders Grooming and Storage area for these clients offers lockers, grooming and wash areas. Storage of trucks and trailers is offered as well. Primary services available to prospective boarders are the option of either training, stall or field board. Fees includes hay and grain as needed, minor first aid, and the administration of routine medications (owners remain responsible for all medication costs). Horses on long term medication for chronic health problems will be treated once daily at no charge. Stall board are $660/month; lockers are included in the stall rate. Looking for more information about boarding at Waredaca? Please submit the form below to receive addition information such as rates and availability.